So, as I was saying in my last post, we left Schopfloch on May 11 looking forward to our last three days in Germany. We were heading to Heidelberg with a very limited agenda. 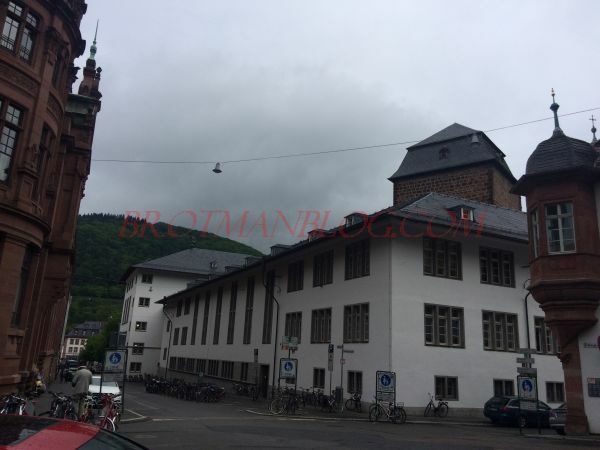 We had only two commitments over the three days: lunch the following day with Ulrike Michel, the wife of my 4th cousin, once removed, Torsten Michel, and a walking tour of Worms on May 13. The rest of our time was open. 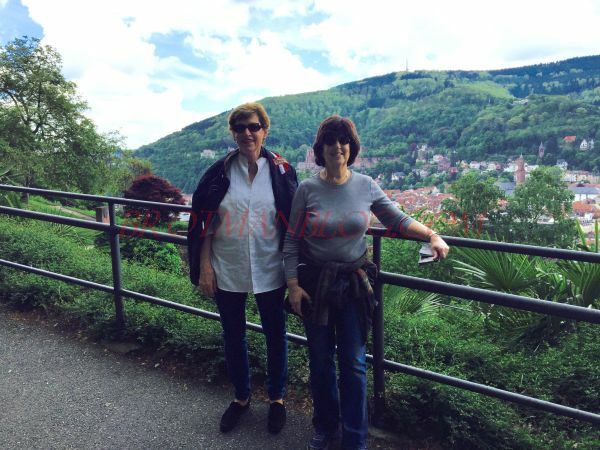 We were just going to explore the city of Heidelberg on our own, drink beer, eat good German bread, enjoy the river and the sights, and relax. 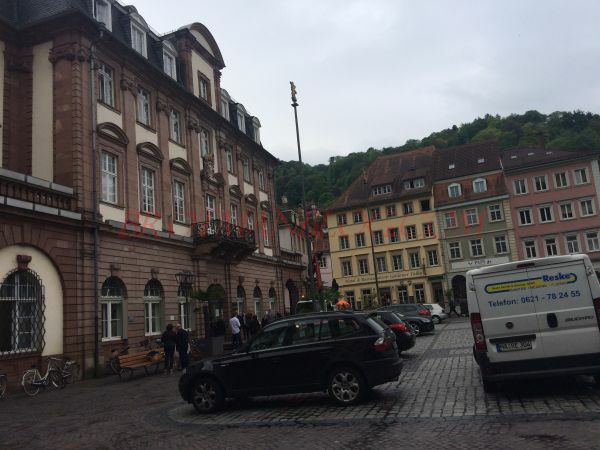 We had about a two hour drive to Heidelberg where we planned to return our rental car to Hertz by 6 pm and take a cab to our hotel in the old part of the city. As we drove out of Schopfloch, we were quite relaxed, and our British GPS lady was in charge of directions. We reached the end of the slow road that brought us out of Schopfloch and stopped to make a left onto a busier road, Bundestrasse 25. Harvey looked both ways, saw no cars coming, and pulled onto the road, turning left. We had already made the turn and were proceeding straight on the road when we were hit from behind. We were, of course, stunned. How could we get hit from behind after completing the turn onto the road? Fortunately we were not hurt, and once we got out of the car, we knew that no one in the car that hit us was hurt either. The other driver, a German man perhaps our age or a little older, spoke a little English and was very nice and calm and said we had to call the police. We waited at least twenty minutes for the police to arrive. Two policemen arrived—young men who spoke English fluently and who were extremely friendly and pleasant. They spent several minutes first talking to the other driver—in German, so we had no idea what was said. Then they approached Harvey and told him, without asking him what happened, that he had failed to yield and had violated the traffic law, and there was a penalty of 150 Euros. We were flabbergasted. How could we be at fault when we were hit from behind? And we had definitely not only yielded at the intersection—-we had made a full stop because we wanted to be sure we knew where we were going. But it was clear that there was no point in arguing with the policemen and the other driver. 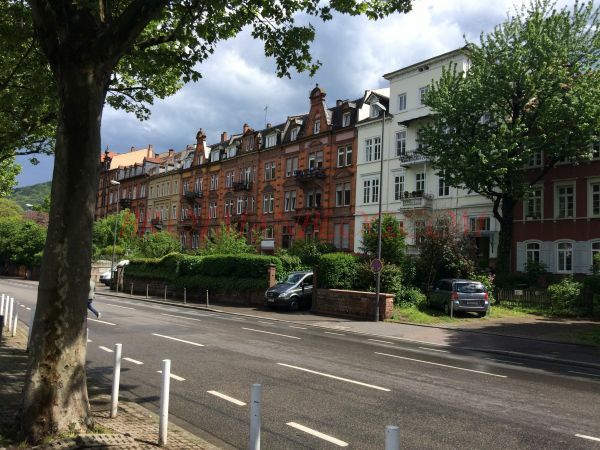 The police told us to follow them back to the station in Dinkelsbuhl (about eight miles out of our way), where Harvey signed papers in German that were not explained to him and paid the fine. Meanwhile, I was trying to get Hertz on the phone to find out what we needed to do to be sure our insurance contract covered the damage. We had taken out full insurance as part of the rental agreement, so we weren’t worried about the damage to the car, but we did want to be sure that we followed the right protocol. But no one answered the phone at the Heidelberg office; no one answered the phone on the Hertz emergency line. We called Hertz in the US, and they had no answers. So we were both now exasperated, annoyed, and frustrated. So much for being relaxed! 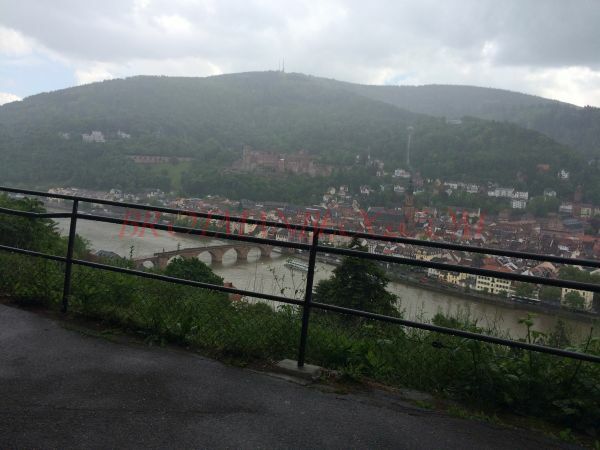 Fortunately, the rest of our trip to Heidelberg went smoothly. We arrived in Heidelberg probably around 6:30, 6:45. The Hertz office was closed, so we left the car, the police report, and the keys, hoping that we had done all we needed to do. And we put it all behind us, determined to enjoy those last three days. And we did. 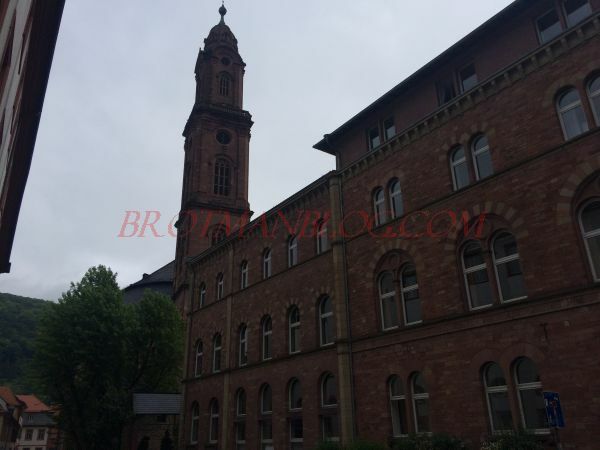 Our taxi dropped us off at the Hotel Villa Marstall, a small European-style hotel right on the Neckar River. Our room was beautiful with a lovely view looking over the river. The receptionist downstairs suggested a sushi place for dinner, and it was just perfect. Casual, good Japanese beer, great sushi. We were able to move beyond the stress of the accident. As we walked back to our hotel after dinner, I noticed a few people standing on an open plaza right in front of the door to our hotel. There was a stone block that they were reading at the end of the plaza, and as I looked at it from a distance, I noticed that there was Hebrew lettering. 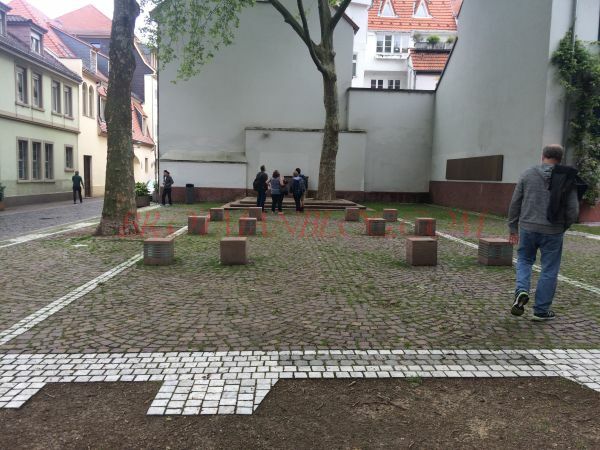 I walked over and read that the plaza marked the location of the former Heidelberg synagogue, which was, like so many hundreds of others in Germany, destroyed on Kristallnacht. 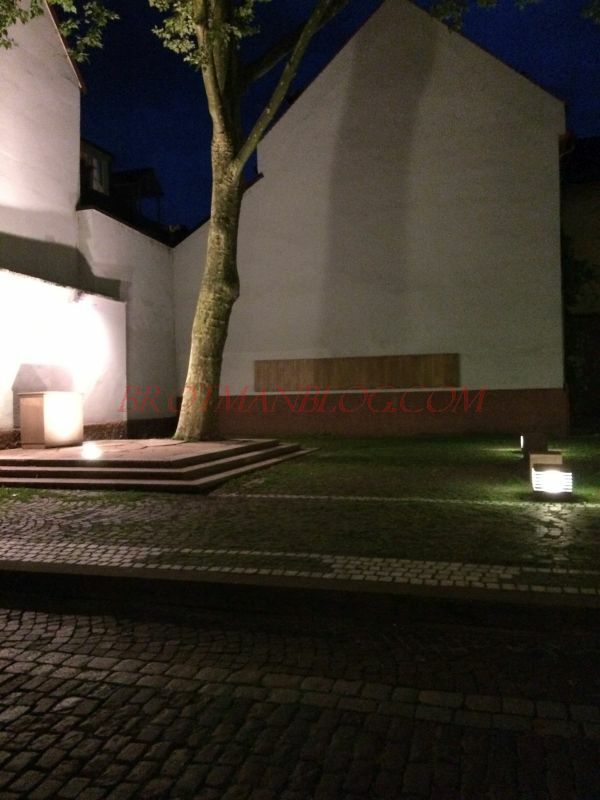 The next morning when we left the hotel, we saw that the perimeter of the former synagogue had been outlined in white marble stones placed into the plaza. 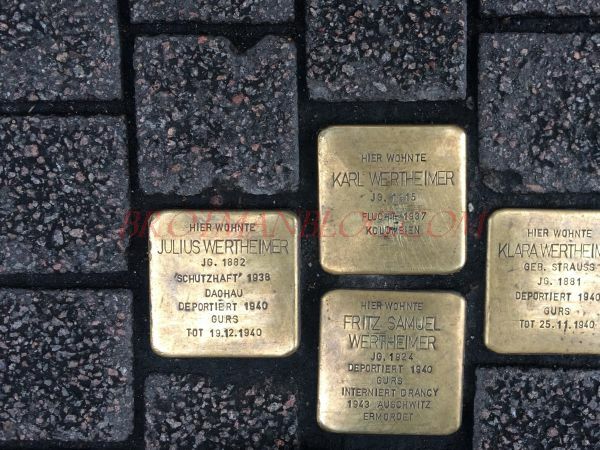 As in every place we visited in Germany, there are markers to remind everyone that there was once a Jewish community here and that it had been destroyed. 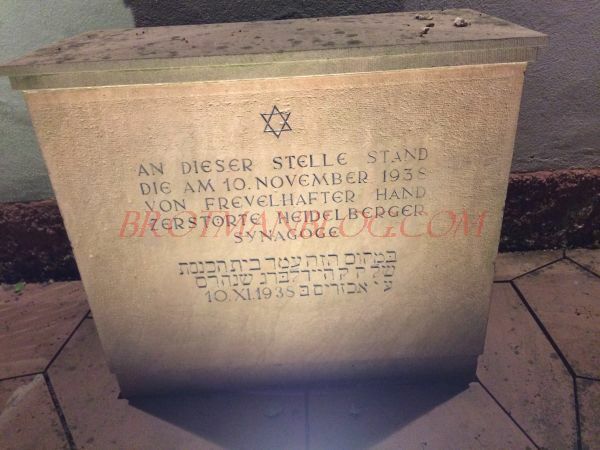 We had picked the hotel without knowing anything about the location of the former synagogue. It felt rather eerie and yet comforting that we were staying right next to it. 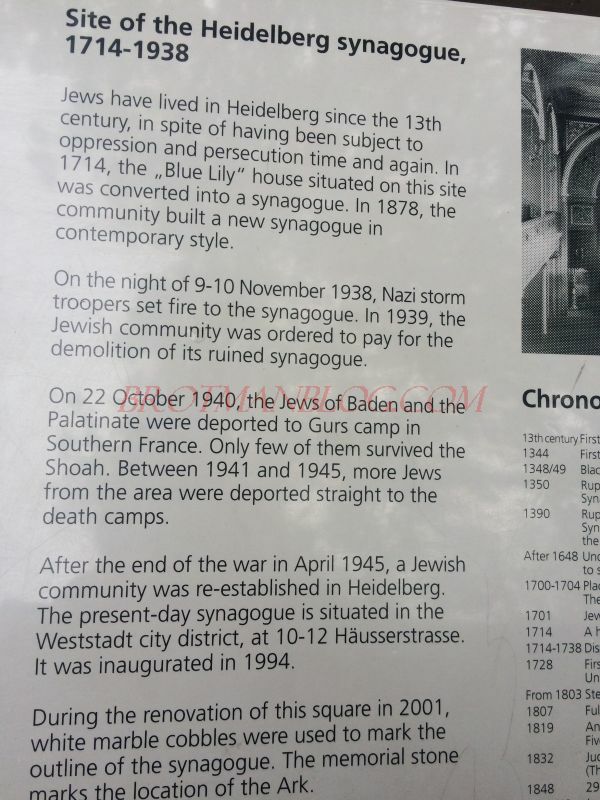 It was also comforting to know that there is now a new synagogue in Heidelberg. 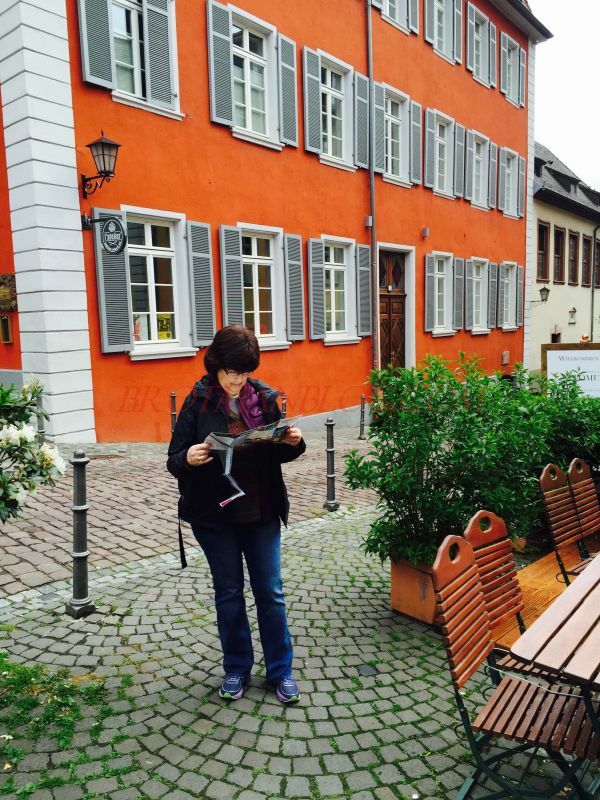 We spent our first morning in this gorgeous city doing a self-guided walking tour of the Altstadt, the old city. 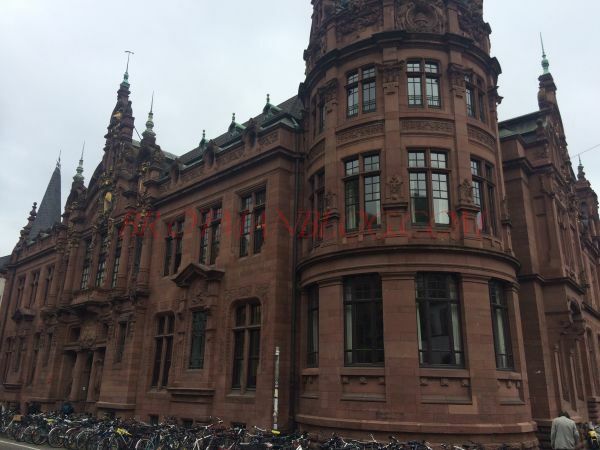 First we walked through Universitatplatz, the part of the old city where there are many buildings of the University of Heidelberg. The university was founded in 1386, making it the oldest university in Germany; today there are 30,000 students studying at the university. As in Wurzburg, the student population gives the city a young and vibrant feel. 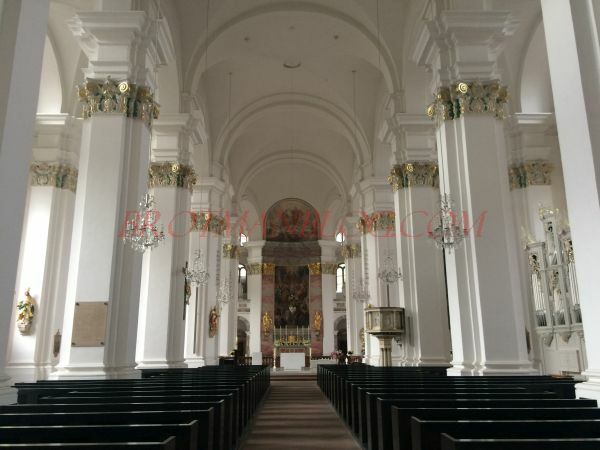 The university’s church is Peterskirche (St. Peter’s); it is even older than the university as it was built in the late 12th century and expanded in the 14th century. It has been the university church since 1896. Perhaps the most impressive and eye-catching university building we saw was the library; it is truly magnificent. It was built between 1901 and 1905. Across from the library was the Jesuit Church with its striking white interior. 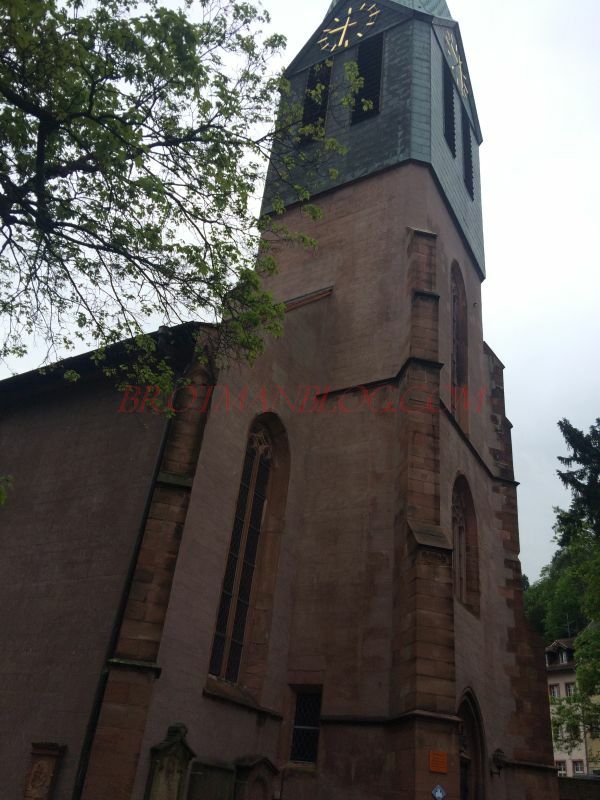 It was built in the 18th century, with a tower added in the 19th. 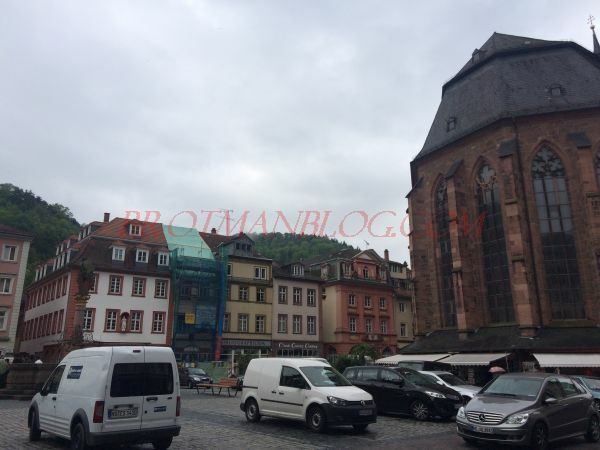 We then walked through the old city, passing other university buildings and along narrow winding streets to the main market square in Heidelberg. The Church of the Holy Spirit, which was started in the 14th century but took 150 years to complete, dominates the square. The market square itself is framed by the former homes of wealthy merchants, whose wealth is quite apparent from the large and elaborate homes. Today these are mostly hotels, restaurants, and stores. Ulrike was the genealogist in the Michel family, and she and I had been in touch several years ago, but had then fallen out of touch. 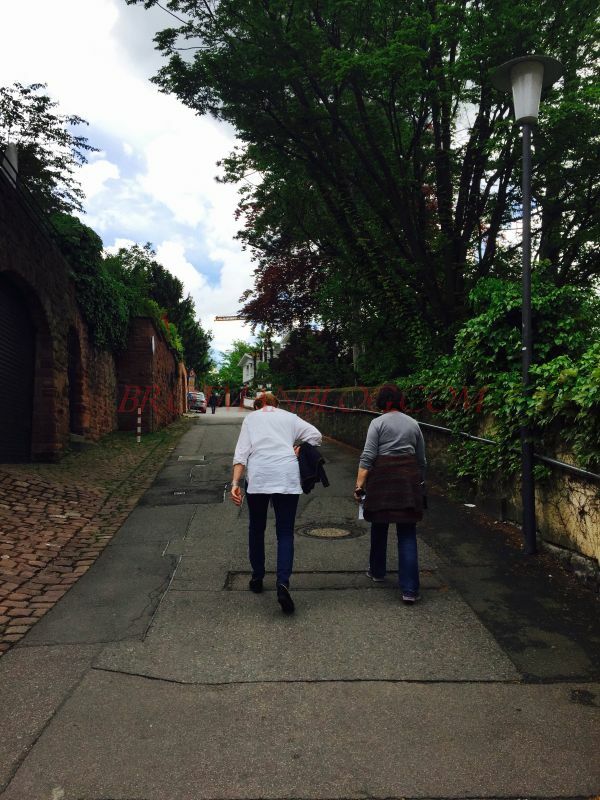 I had emailed her right before the trip, and she was excited to meet me and drove to Heidelberg to have lunch with us. We had a lovely lunch together, and Ulrike shared with us her recent discovery of her husband’s cousins on the Michel side (not my side) in Israel. She was very excited about meeting these people, and it was a wonderful genealogy success story. After lunch we invited Ulrike to join us for a walk up Philosopher’s Way on the other side of the river. 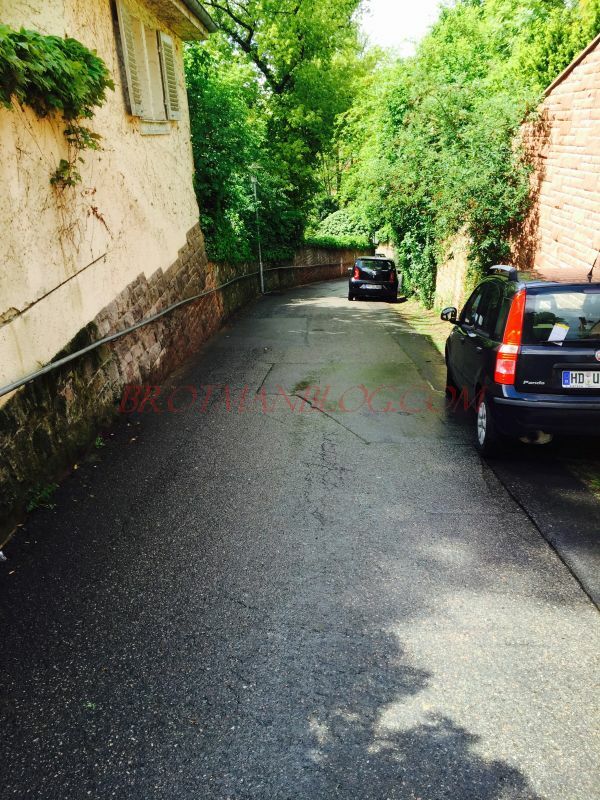 Philosopher’s Way is a path (actually a paved road in large part) that winds up the hills where it is said faculty and students from the University of Heidelberg would stroll while contemplating scholarly matters. There is a snake path that is usually open to climb to (or from) the path, but it was closed for safety reasons while we were there. So instead Ulrike, Harvey and I walked along the river, crossed over at a bridge, and then found the entrance to Philosopher’s Way and started climbing. And it was steep and long. Longer and steeper than we had expected. But we were determined to get to the top. 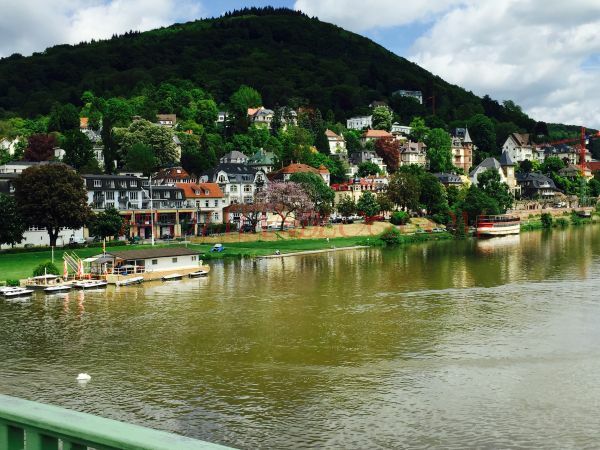 And when we did, we were rewarded with spectacular views of Heidelberg across the river. Soon after we reached the top, it started raining. It had been sunny and beautiful, and none of us was prepared for rain. We stood under a tree for a bit, but then decided we had to keep moving despite the rain. But we weren’t sure which way to go—retrace our steps or go forward and find another way down? We (well, Ulrike) asked several people who kept telling us that if we went further, there was a way down that would bring us closer to the location of our hotel across the river. So we went ahead. But the “other way down” never appeared, and finally Harvey said we should just turn back. Ulrike was determined to find the other route down, but we were growing increasingly skeptical of its existence. So we divided up—Ulrike moving on, Harvey and I turning back from where we’d come. A few minutes after dividing up, the rain intensified. Harvey and I stopped at a little covered pavilion on the side of the path to wait for the rain to let up. Within another few minutes, my cell phone rang. 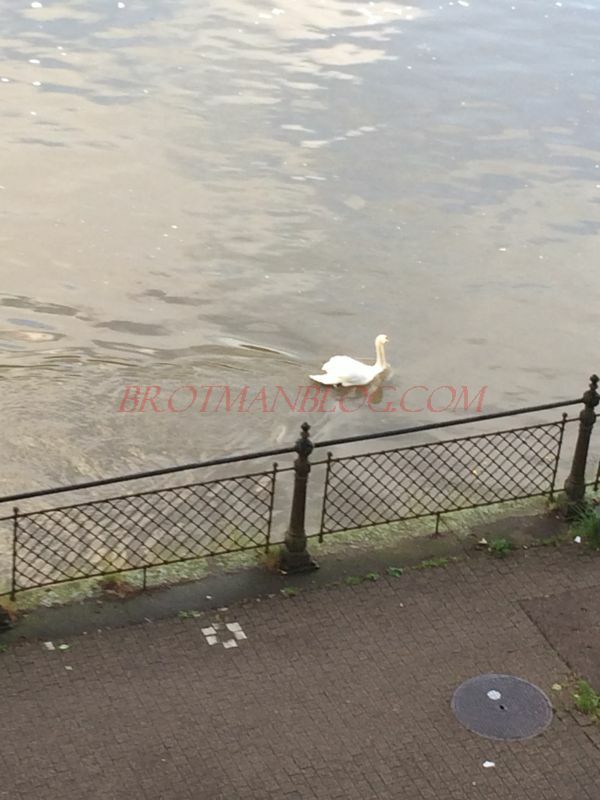 It was Ulrike—she had decided to turn around after learning that the “other way down” would bring her even further from the bridge across the river. We waited for her, all having a good laugh at our misadventures on the so-called Philosophers Way. I don’t think any of us had one serious intellectual thought throughout our entire walk! But it was worth the climb, and the extra time we got to spend with Ulrike was wonderful. Once back near our hotel, we said goodbye to our new friend and cousin. It had been a full and interesting and fun day. 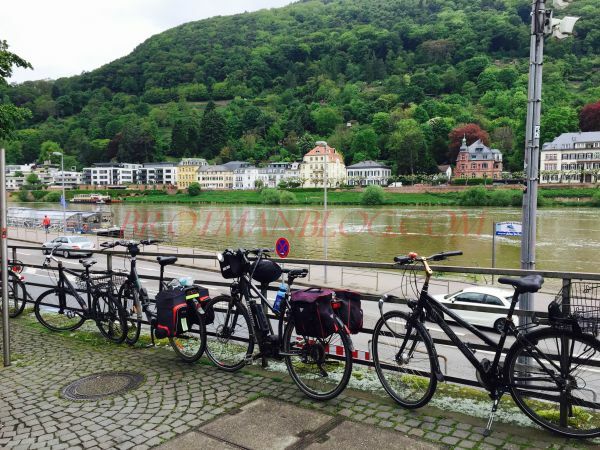 Heidelberg was exceeding our expectations as a good final stop on our journey through Germany. 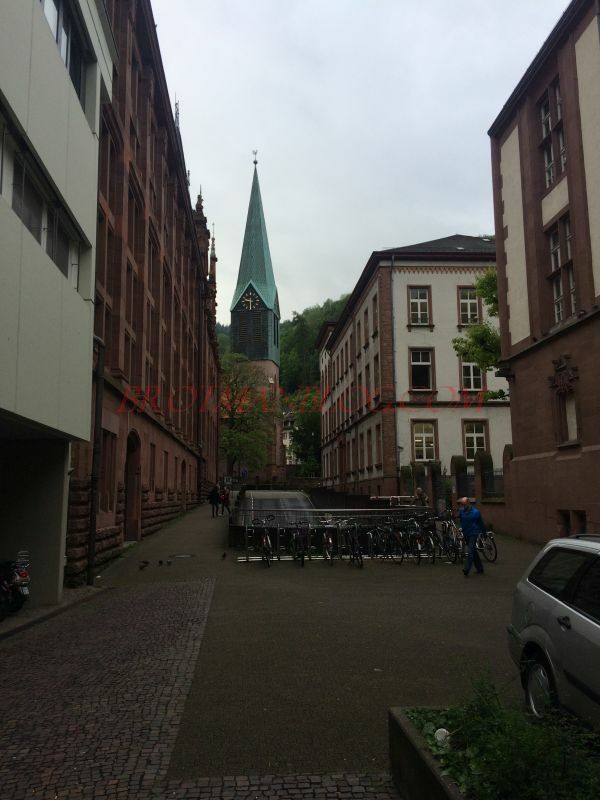 We had two days left—one in Worms and then a final day in Heidelberg. 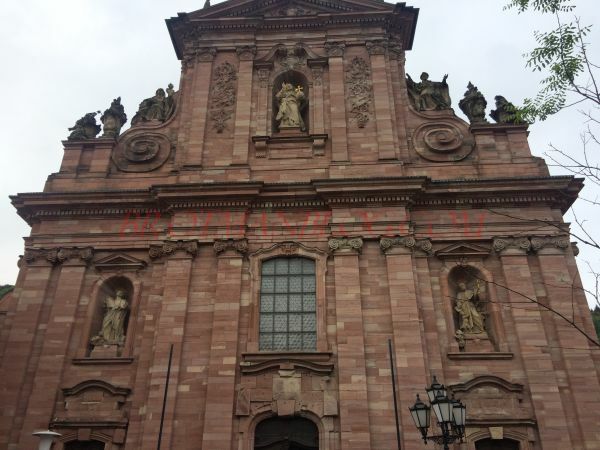 This entry was posted in Genealogy, Germany, Germany trip 2017, Holocaust, Schoenfeld, Travel and tagged Germany, Heidelberg, Travel by Amy. Bookmark the permalink. So sorry to hear your trip wound down with an accident. 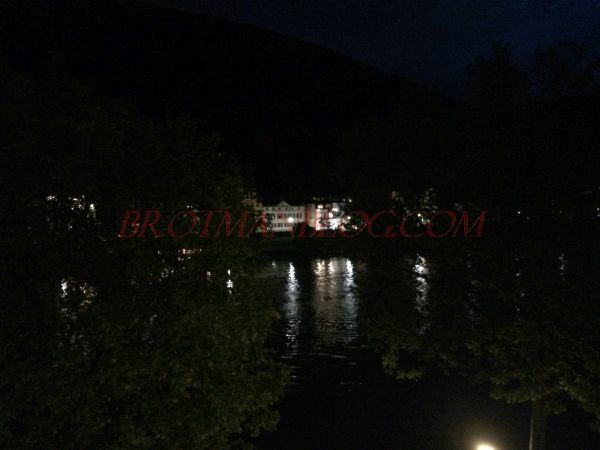 Sounds like you had an interesting time your first day in Heidelberg although Mother Nature was not being very nice. I hope you are able to resolve things with Hertz soon. 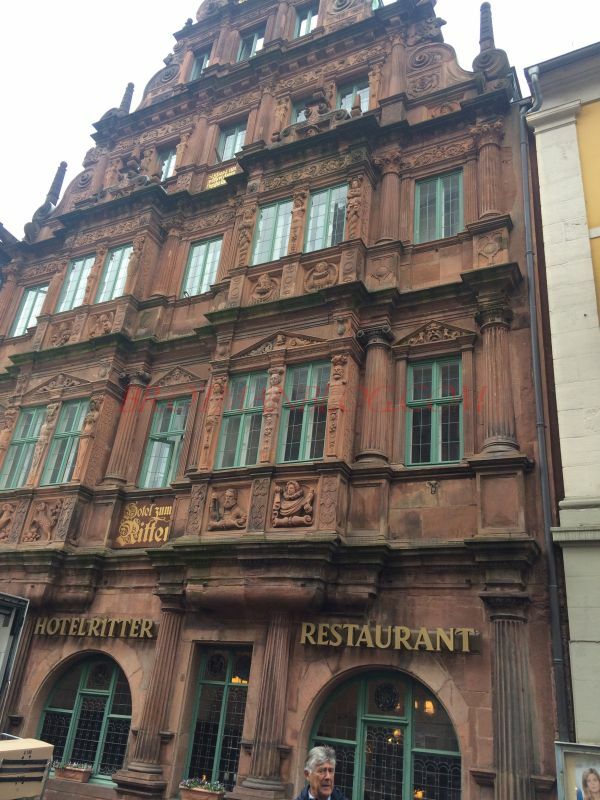 But glad you enjoyed Heidelberg and were able to see such history right next to your hotel. So do I, Debi. I will keep you all posted! And yes, we did not let it affect the rest of our trip. Sorry to hear about the accident, and the problems with the authorities and Hertz. Glad that no one was hurt. 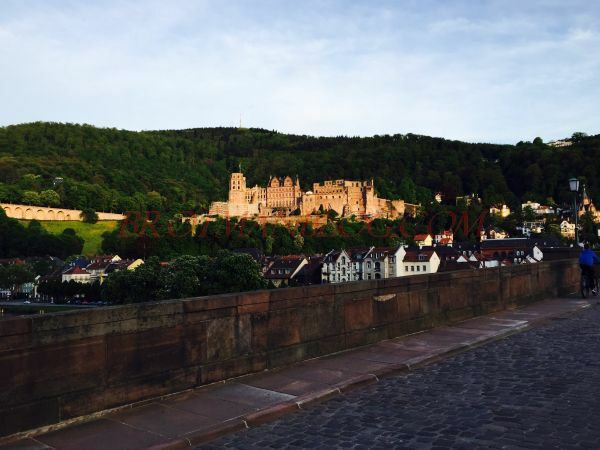 I especially enjoyed reading your blog this morning and thinking back to my trip to Heidelberg in 1961. Does it look like it’s changed at all? Thank you! 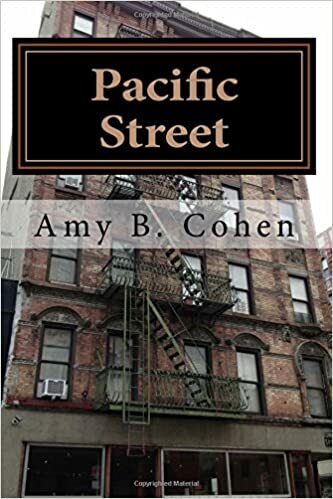 Hi Amy~ 2 things struck a cord with me…. 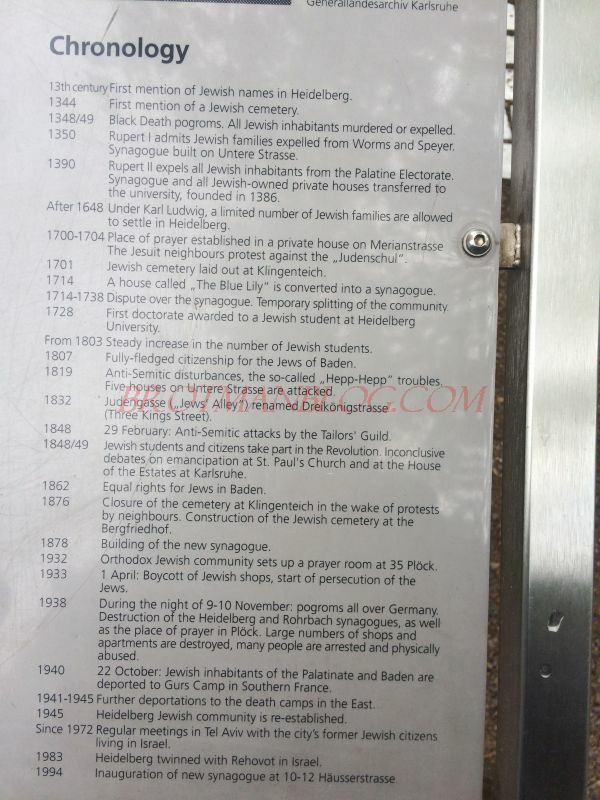 the detailed long listing of Jewish events starting in the 1300’s, and all the bicycle’s in the photo’s especially at the Jesuit church which was magnificent. What an unbelievable awesome adventure you have been on, accident and all. Photo’s of everything simply perfect! Amy- amazed at your trip and all the connections with family. Next time you go I have relatives in Kallstadt on the wine route. The have a winery Benderhoff and have lovely Rieseling wines. They are my cousins through my great great grandmother Margerethe Bender Kuhn. My cousin runs the winery with her husband Otto Hass-her son is helping run the winery. My grandfather sent care packages to her father and mother and family to help them during the war recovery. They never forgot this, so family is treated royally. The family has run the winery for 200 years-even more than that with the union of the Hartung/Bender family. I am related to the Heinz family (ketchup) and Trumps (only through marriage in the 1800’s). I also have a close friend in Cologne-named Ulrike Bruhl. She would welcome you too. She and her husband came to live with us the day after my brother was killed in a motorcycle accident. She was with the Penn program of International House- their apt. was not ready. She was like a big sister to me. I visited her and my family 6 years ago. In the meantimes, I did my DNA with Ancestry.com. The results are very interesting! Wow, that is quite a family legacy. 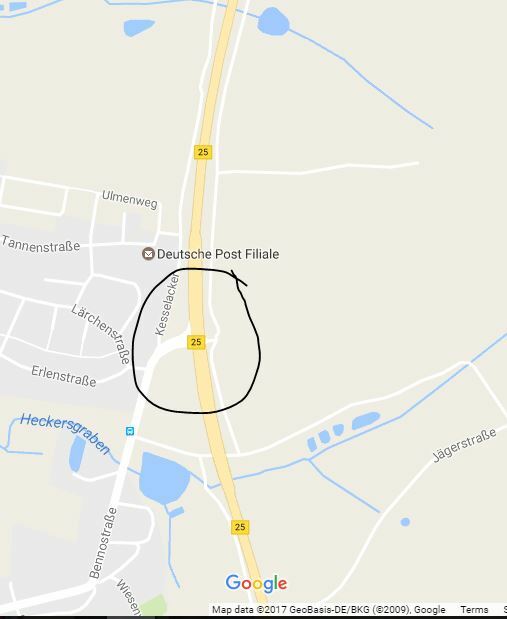 Do you get to Germany often? And I am sorry about your brother—how awful. Thank you very much, Linda—I am very flattered! I love it. Memories, memories. At the end of the Philosophenweg there is, or used to be, a restaurant called “Molkenkur” where they serve delicious “Himbeersaft” (raspberry juice) for us kids and coffee for the adults, and of course pastries. We went there quite often on Sunday afternoons. 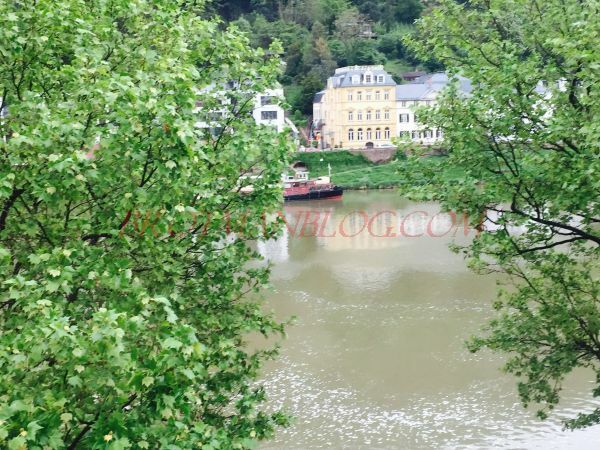 Or else we went to the Schloss (castle) on the other side of the Neckar. 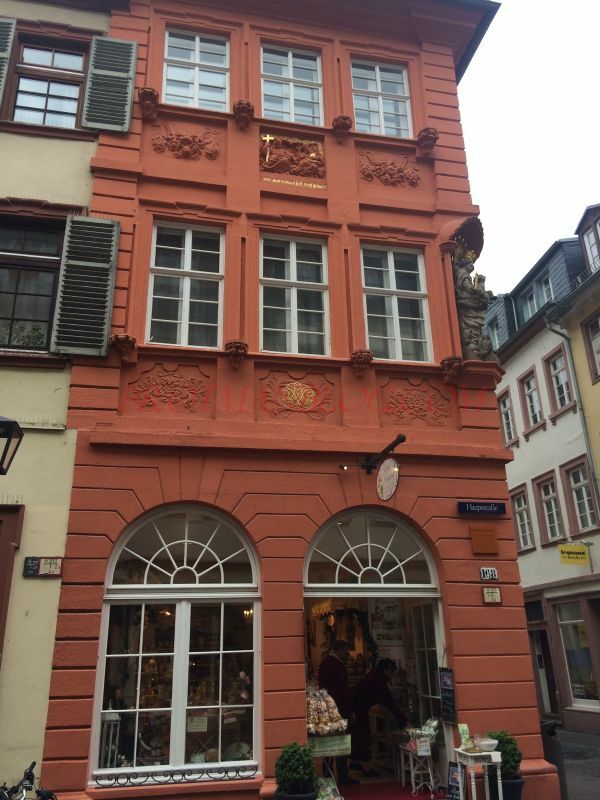 Also, my orthodontist lived in Heidelberg and I had to travel there quite often. He was very advanced in his field as compared with German standards at the time, having studied his field in the U.S.
Too bad about the accident. I guess left turns are always at fault. What wonderful memories, Lotte! Thank you for sharing. Was the restaurant up top or down at the bottom? There was a stand selling drinks near the top, but not a real restaurants. And my next post is about our visit to the Schloss! Orthodontry—I thought that was an invention of the 1960s! Thanks for your comments. I love hearing from you. The restaurant was called Molkenkur. It was at the Philosophenhoehe which is top of the Philosophenweg. It was not a fancy place. I don’t know about the traffic rules in Germany. But I do know that I once had a similar accident here and that’s what I was told by my insurance co.
Maybe it is still there—but I didn’t notice. It was raining, however, so we might not have noticed. What a horrible thing to happen! I’m glad you managed to stop it spoiling your holiday, but I’m sorry the issue is on-going. We’ve had a couple of similar incidents in rental cars, but thankfully in English-speaking countries. They still take time and energy to resolve, so I really feel for you. Well, in the big picture, it’s not a big deal. As long as our insurance from Hertz ends up covering the cost, it will just be another travel story. Love the photos, Amy! Sorry to hear about the accident, but your view from the hotel that evening (coupled with the beer) sounds like the perfect combination to unwind and let it go (at least that’s what I was thinking until I read at the end that you’re still dealing with Hertz. Oof! Good luck!). We did let it go for the remainder of the trip. We weren’t going to let it affect our feelings about Germany or the overall experience. Life is too short! Oh! How frustrating to deal with a car accident in a foreign country. They are hard enough to deal with in America. I can only image how complicated it has been. I love all of the pictures. The bright orange building (near the beginning of your post) is so lovely, I don’t particularly care for orange so I was surprised by how much I liked the building. I love how adventurous you are, and how you connected with so many people – old and new friends – on your trip. I’m such an introvert it would be really hard for me to meet new people each day and spend so much time with them. I can see how rewarding it was for you though. I’m excited to hear about the rest of the trip. I had to chuckle at the word “adventurous”–Harvey and I are both so risk averse about most things that I never think of us as adventurous. But this trip was an adventure. And I am also quite introverted, which is why we never travel with tour groups or on cruises. The thought of having to make small talk with strangers day and night gives me the shakes! However, this was different since it was just an extra person or two and in many cases they were people I’d been in touch with for quite a while by email. I know exactly what you mean. I had very little time alone (since my husband was with me 24/7), and I do need those hours to recharge in everyday life. But when traveling—you need to adjust. I did try to translate the police report, but it didn’t say much that I could make sense of. And yes, it was a small blip in an otherwise wonderful day and wonderful trip. Wow, that sounds wonderful. 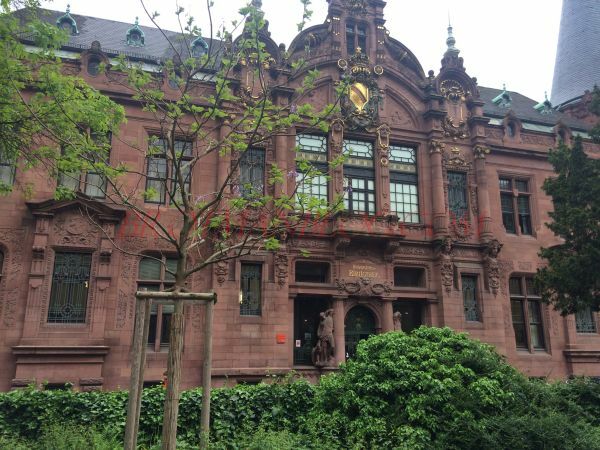 Makes me wish I could go back to school and do a year abroad in Heidelberg (although I was already done with school by 1979). Thanks, Dorothee! Have so much enjoyed reading all about your German holiday, enhanced by the wonderful photo’s. Michel family for 2 weeks on a school trip in the 1970’s.